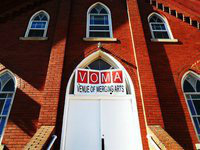 The Venue Of Merging Arts (VOMA) is a community center for the arts. We cater to original music and art of all styles, types and genres. As such, we are a "Variety Venue" with different things happening on any given night. Regular events include The Blues Gathering on the last Saturday of each month, and the Jazz Series on the third Saturday of each month. Please visit our website for a calendar of events, and VomaJohnstown on Facebook for great pictures and videos from events past. Thank you.